During the 60s, 70s and 80s roped climbing was the popular form and at the time the boulders were largely neglected. Unfortunately, the cliffs at the overlook do not have the volume of high quality climbs necessary to draw the climbing masses to this corner of the Allegheny National Forest. 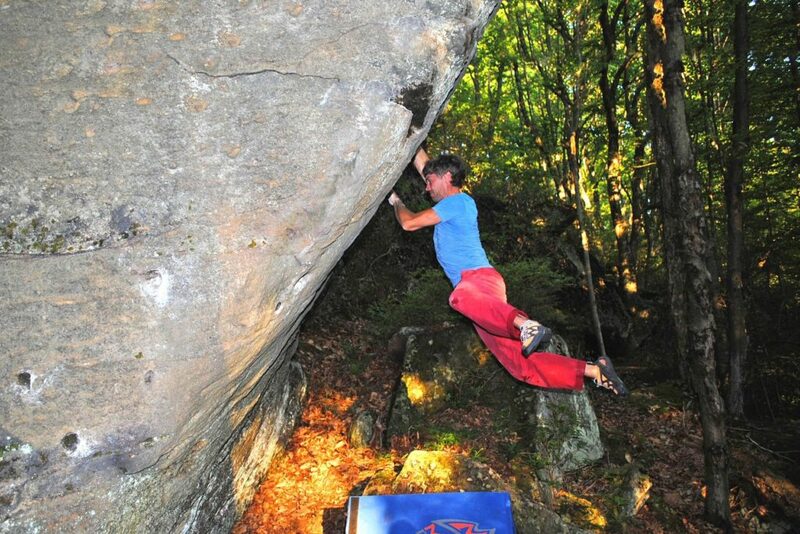 The first significant push for modern bouldering began at the end of the 90’s with a small group of crashpad-toting pebble-wrestlers whose chalk and grit parties resulted in the pioneering of a couple hundred problems. 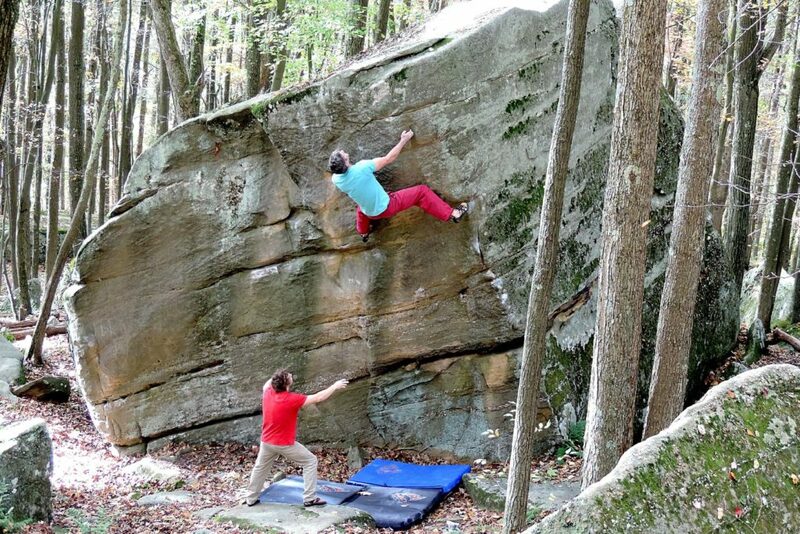 These bouldering hermits had uncovered the true potential of Rimrock climbing. It was not the cliffs, but the boulders surrounding the overlook. Still, these early pioneers were not focused on getting the word out. Rimrock was an inadvertent secret and there was nothing to compel the larger climbing world to turn their gaze to Northwest Pennsylvania. Rimrock is located a mere twenty minutes from the small town of Warren. In recent years, Warren has struggled through hard economic times and a steady decline in population. However, the city is attempting to bounce back and outdoor recreation is playing a strong role. 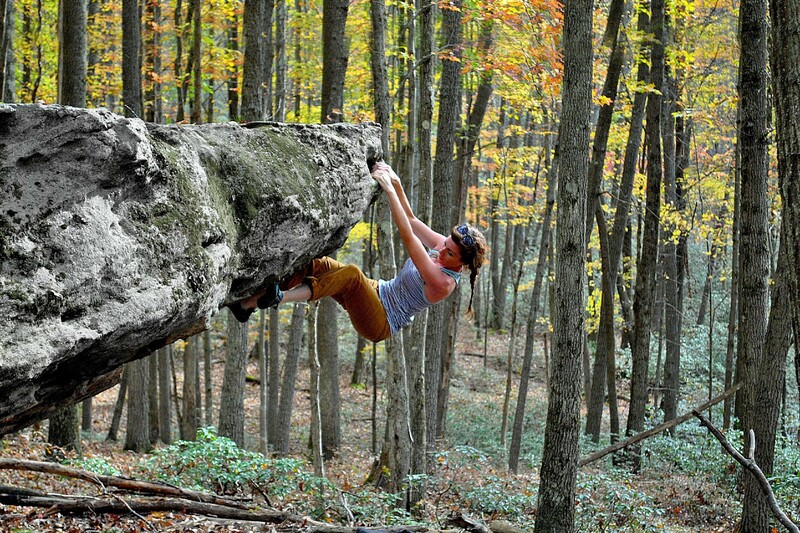 The Allegheny National Forest near Warren is truly an outdoor haven, and word about the bouldering at Rimrock has begun to spread. Climbers from Pittsburgh, Buffalo, and other nearby areas have begun to show interest. 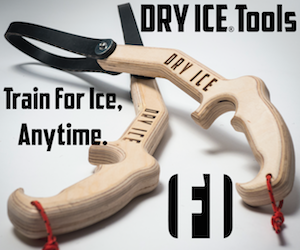 In addition, a new band of young local climbers is eager to continue developing the area. Currently, there is little to aid them, as information about climbing at Rimrock is tribal knowledge. Without a guide, or guidebook, the experience can be quite frustrating, and all but the truly adventuresome have been kept at bay. Happily, there is a guidebook in the works and it is nearing completion. It’s time to get the word out – to graduate from a small, hidden playground for local troglodytes and open our doors to a larger community. This guidebook is going to be an important resource for the community and will help numerous climbers find and enjoy this amazing natural resource.